My prayers go out to the family of Robyn Gardner today. 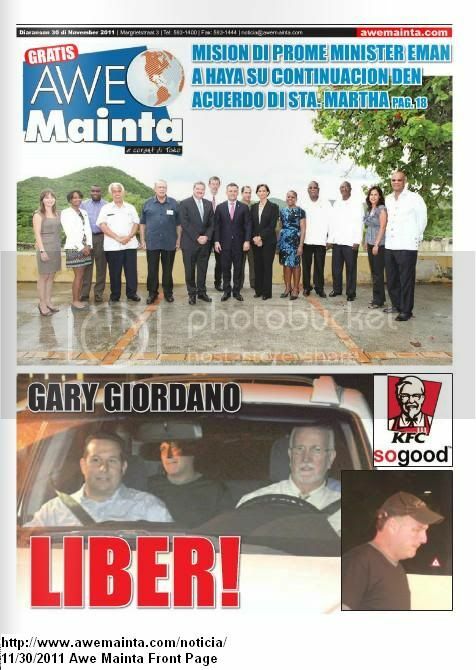 Could it be their silence of the family since the arrest of Gary Giordano be an indication that there was a false confidence that the wheels of Aruban justice were turning on behalf of Robyn? 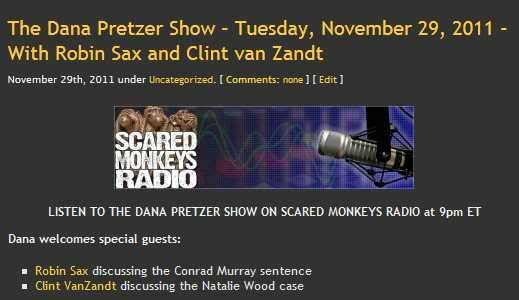 GRETA VAN SUSTEREN, HOST: All right. So you can say with 100 percent certainly there's nothing new, right? KELLY: I can say it with 99 percent. I think it was disappointing to me and actually extraordinarily painful and almost cruel for Beth and Dave after being down there. They'd like to get some answers and they'd like to see some progress made. And it's not fair to bring them down there with the false promises, with raised expectations, sort of a dog and pony show down there with no substance. And it was — it just really took whatever spirit, almost, that Beth and Dave had left, went through that this weekend. It was really — it was terribly painful, for lack of a better expression. If Jose Baez was sincere ... Gary Giordano would remain on the Island for the outcome of the hearing. We are talking about hours. 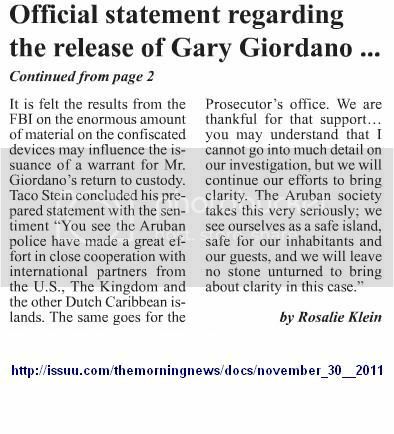 If the Aruba justice system was about justice for Robyn Gardner ... Gary Giordano's release would have been put ahead 24 hours. Gary Giordano, the lone suspect in the disappearance of his travel companion Robyn Gardner, is expected to be released from an Aruban jail this evening and bolt from the island before an appeals court can meet to consider keeping him incarcerated. 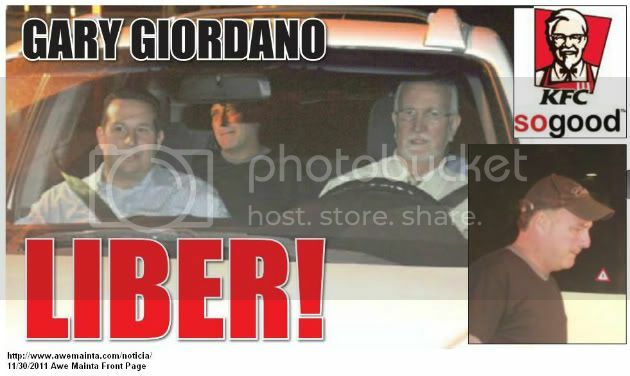 Giordano, 50, is scheduled to be released about 8 p.m. this evening. He could be back home in Gaithersburg, Md., Wednesday morning. The island's prosecutors have appealed his release, but Aruba's three judge appeals panel's weekly meeting isn't set to begin until 11 a.m. Wednesday. Taco Stein, Aruba's solicitor general, is scrambling to convince the appeals panel to convene sooner than Wednesday morning. Giordano's lawyer, Jose Baez, told ABC News that his client would be willing to comply with any extradition order if needed at a later date. "Should they decide to extradite him, Gary's not going to run from anything. Gary's not running from anything. He'll come back voluntarily. It's not going to be anything that I think is going to be a problem," Baez said. Just hours before Gary Giordano is set to be free from an Aruba jail, the family of missing Maryland woman Robyn Gardner has released a statement to ABC News saying they are disappointed at the lack of answers about how she disappeared. "Needless to say, our family is very disappointed that even after all this time, we are no closer to finding out what happened to our Robyn," Kelly Reed, Gardner's cousin, told ABC News in a statement today. "We trust that the FBI and the Aruban authorities will continue their fervent efforts to investigate her disappearance." The island's prosecutors have appealed Giordano's release, but Aruba's three judge appeals panel's weekly meeting isn't set to begin until 11 a.m. Wednesday. Gardner's family said today they are still hopeful that someone with information about Gardner's whereabouts could come forward. "Perhaps the public attention that this has generated will result in someone stepping forward with information that will help find her," Reed said. Aruban authorities told ABC News that they would seriously consider extraditing Giordano if they discover any hard evidence against him. If Giordano leaves the island, he will leave behind his laptop and Blackberry. Investigators tell ABC News that they are just beginning to pore through the computer, as well as Gardner's iPad -- both of which contain tens of thousands of documents that shed light on the relationship the two had -- which Giordano has previously said was almost entirely physical. Page 208-209: The goal of education is twofold: to bring a message about personal safety to high-school and college students and to educate travellers. So staying quiet like Aruba advised got you NADA! ORANJESTAD, Aruba — A U.S. businessman jailed in Aruba is due to be released within hours but the prosecutor’s office says his freedom might not last very long. Solicitor General Taco Stein says Aruban authorities will immediately seek the extradition of Gary Giordano if an appeal’s court rules in the prosecution’s favor and extends his pretrial detention. Earlier, prosecutors said they might wait to gather more evidence before seeking extradition. An American Express spokeswoman, Gail Wasserman, said she could not confirm that Giordano has such a policy but said anyone making such a claim would have to produce documentation such as a death certificate and any police reports. "Then we would make a determination if the claim is payable." No claim would be paid if it turned out there was fraud or "anything untoward" that would void the policy, she said. Stein said authorities have been conducting active searches for Gardner's body and last week sent divers and underwater robots to search in the area where Giordano reported her missing. They are also awaiting additional forensic evidence, including an FBI analysis of Giordano's Blackberry. Investigators do not believe Gardner was pulled out to sea based on weather conditions and a re-enactment. "We know he has been lying about what happened ... We know his story is not true," Stein said. 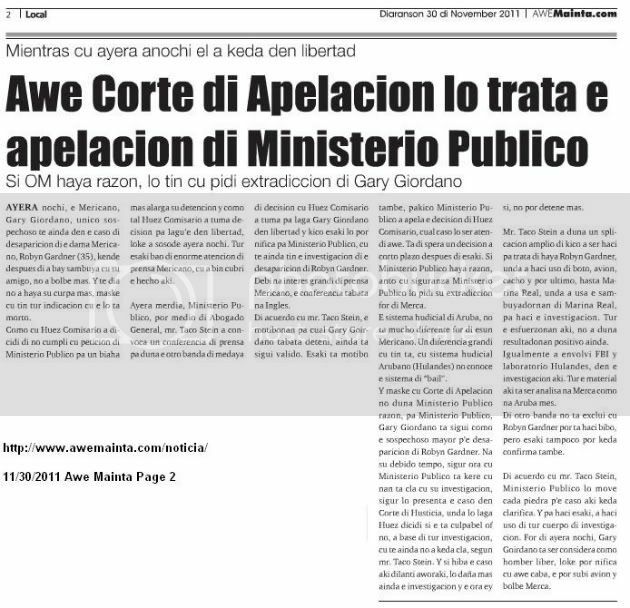 one rato ministerio publico owing to end of anuncia cu they owing to apela the decision of huez comisario for freedom of gary giordano. today tuesday gary giordano is go pound. mayan three huez will deal the apelacion of ministerio publico. if the leave at please of ministerio publico y gary giordano owing to bandona aruba, nifica cu have to ask his extradicion for of merca. this can last lunanan for succeed haye bek on territory of aruba. Considering an appeal was a given ... why was a 24/48 hour (?) travel restriction not a condition of Gary Giordano's release? Somehow .... something akin to Joran van der Sloot ... I do not believe that Giordano ... the prime suspect in a murder of a touist on the Island of Aruba ... will be held accountable by the Aruban justice system. Without a voice ... without an advocate ... could it be that Aruba anticipates that Robyn Gardner will become a distance memory. ORANJESTAD, Aruba — Maryland businessman Gary Giordano has been released from jail in Aruba after nearly four months of detention as a suspect in the disappearance of his traveling companion, Robyn Gardner. Giordano is now free to leave the Dutch Caribbean island but his immediate plans are not clear. Prosecutors still consider him a suspect in Gardner’s presumed death. He left the jail with his lawyers. 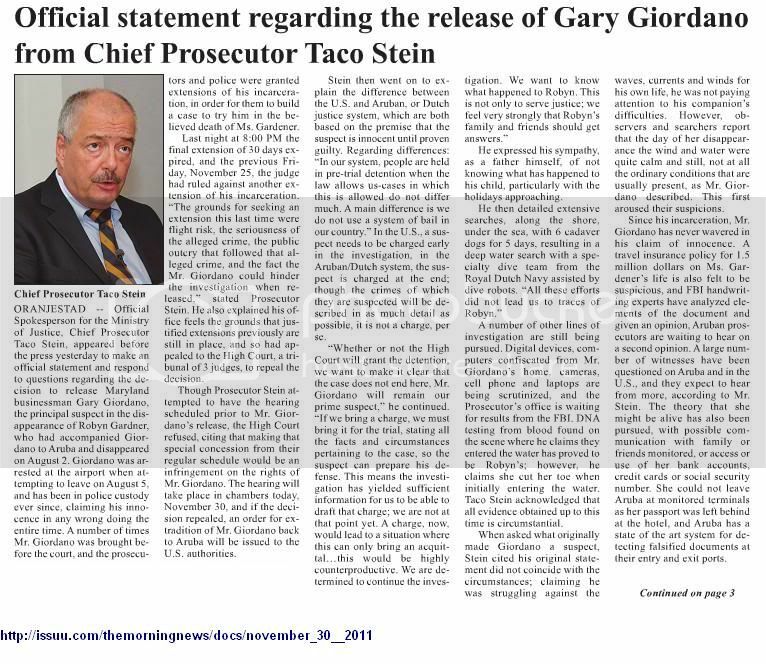 Solicitor General Taco Stein says Aruban authorities will immediately seek the extradition of Gary Giordano if an appeal's court rules in the prosecution's favor and extends his pretrial detention. Earlier, prosecutors said they might wait to gather more evidence before seeking extradition. The appeal ruling is expected Wednesday. A judge ruled last week that prosecutors lacked enough evidence to keep holding Giordano as a suspect in the disappearance and presumed death of his travel companion, Robyn Gardner in August. Giordano denies wrongdoing. Stein spoke Tuesday, hours before the American's scheduled release. after of owing to happen some month encarcela, gary giordano owing to leave for of kia today because; man pound. his advocate of aruba mr. chris lejuez owing to bay busk'e together cu his advocate mericano jose baez. intencion is for sleep one night in hotel y for bandona aruba tomorrow morning trempan on vuelo for miami. fiscal do not of acuerdo cu the decision of huez comisario y tomorrow end will have one caso of apelacion in corte superior. by inicio of the caso here had very atencion of prensa internacional for her caso here. today, at instant cu gary giordano owing to leave of kia for 7:50pm, had enough atencion of specialmente camaranan for of merca. for 5:30am is wait for giordano at aeropuerto for her leave cu the first buelo for merca. at his exit of kia, several car cu prensa mericano owing to core his slow, buscando the "best shot" of dje, siendo the unique sospechoso in desaparicion of one tourist mericano at nanki beach.